In conversation with DOD (p.325) Heaney revealed the period of intense creative activity that accompanied the genesis of Seeing Things: I was pouncing on twelve liners on all kinds of occasions … chance sentences from my reading. They just turned up and he went with it. This poem pits the skills of the experienced tracker against a creature’s survival instinct; its ability to disappear was not unlike what became of an erstwhile drinking buddy. The old hand knows the answer- initially Back on her tracks, of course, then an act of sheer athleticism (a spring yards off to the side), bringing about the perfect disappearing act (clean break); no scent or sign, her soft landing in her previously made dent (form) further camouflaged (ate the snow). 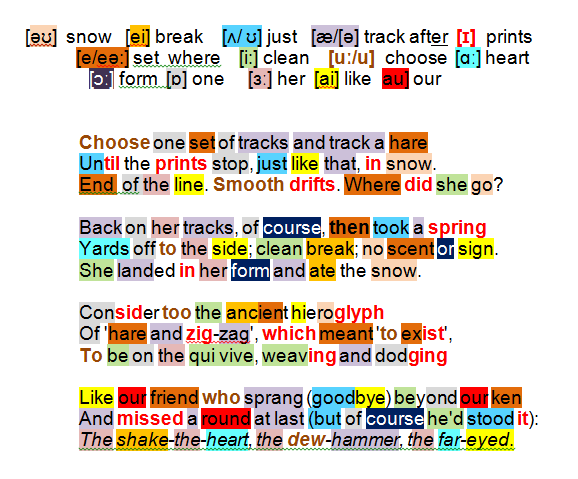 Heaney’s tracking exercise introduces the poet’s further intention: lesson two – find the hieroglyph – a zig-zag at once concrete (hare) and abstract (‘to exist’). The hare’s nervous nature (on the qui vive, weaving and dodging) reminds Heaney of a hare-like chap who suddenly disappeared (our friend who sprang (goodbye) leaving no trace (beyond our ken), a fellow suddenly absent from the local pub (missed a round at last), but who had never failed to pay his way when he was in the bar (but of course he’d stood it). Heaney selects descriptors from an anonymous lyric he translated to describe the man’s affability (shake-the-heart), his early rising (dew-hammer) and alertness to potential pitfalls (far-eyed). mood and tone are relaxed, matter-of-fact like people talking to themselves out loud!